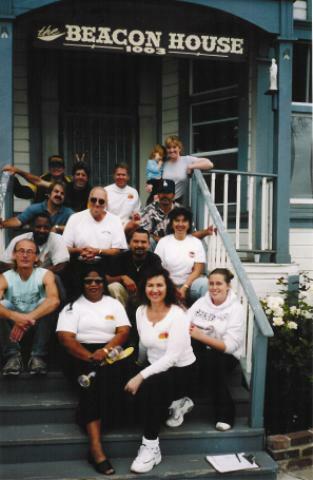 KNMF was chartered in 1991 to help homeless men, women and children (veterans and their families, and L.A.'s needy kids, in particular) throughout Los Angeles, the South Bay, and Harbor Cities. - Conduct Stand Downs (Personal Care Days) for homeless veterans and other homeless men, women, and children living on the streets of Los Angeles. We distribute clothing, shoes, blankets, non-perishable food, hygiene supplies, gifts, toys and warm meals; as well as provide veterans with medical, dental, vaccines, legal, job training, employment, and transitional housing services and opportunities at these events. - Coordinate with other homeless service providers to effectively get veterans off the streets, into jobs, and into homes offering social interaction and the encouragement needed to stay sober and off the streets. - Arrange for medical and dental healthcare for formerly homeless veterans and men in continuum of care transitional housing with VA, UCLA Medical Center, and other healthcare providers. - Distribute clothing, bedding, food, hygiene supplies, sports equipment and gifts to formerly homeless veterans and other needy persons working full-time and living in continuum of care transitional housing facilities. 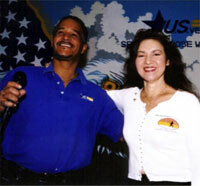 - Provide legal aid for homeless and formerly homeless veterans at Personal Care Days and through referrals. - Conduct Job Fairs and College/Trade School Fairs for all Veterans, including those in transitional housing and homeless veterans for entry into paid and non-paid trade training programs and for entry-level and career ladder employment. - Provide Christmas and quarterly distributions of toys, school supplies, books, teaching aides and materials, games, sports equipment, new clothing to Los Angeles County needy children After School Literacy Programs and Hospitals. - At Rolling Hills Preparatory School, KNMF arranges fully paid, competitive, scholarships for needy children, including children of formerly homeless veterans and other needy youth. 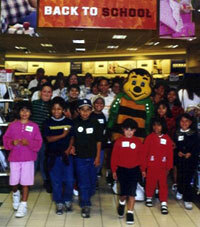 - Conduct shopping sprees and other entertainment events for needy children (including children of formerly homeless veterans) to distribute new personal-care items; including clothing, shoes, school supplies, and toys, sports equipment, games and learning materials to these unfortunate youngsters. - Distribute clothing, bedding, toys, and hygiene supplies to women and children transitioning from shelters. - Because 10% of the nation's homeless can be found on the streets and the shelters of Los Angeles. On any given night, veterans make up 34% of this population. Another 26% are children. We believe they deserve better. 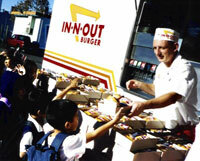 - To carry on the work begun by Kenny Nickelson who, prior to his death at age 23, had a commitment to help the homeless. From age 16, Kenny collected and distributed food, clothing, and blankets to L.A.'s homeless. and the work done by KNMFs many volunteers. Thanks for your kind comments. It was a real joy for me to be at several of your events and to see the great work you are doing to help needy veterans. You are definitely the hands and feet of God as you seek to bring love, respect and services to the veterans that have struggled to integrate back into society. Thanks so much for your very kind and thoughtful email. "Great to be with you two at the event. Looks to me like a lot of important connections were made, doors were opened and needy veterans served. Thanks to all you do and I hope you have a great Thanksgiving. My best to you both and God bless." "Ken and Doris: It was a pleasure to meet you both last week in San Luis Obispo. Thank you for allowing me the honor being invited and also for the recognition. 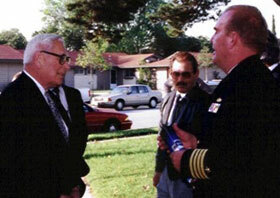 The work you are doing for homeless veterans and families is a tremendous legacy for the work started by your son. Thank you for all you do. Best wishes,"
"My thanks for the incredible work you do at the Kenny Nickelson Memorial Foundation for Homeless Veterans and Children. For over 14 years your organization has been Instrumental in meeting the needs of thousands of homeless men, women, and children, especially veterans, in Los Angeles County. Your tireless efforts to distribute necessities such as clothing, shoes, blankets, food, and hygiene supplies have improved the lives of many suffering veterans in Southern California. In addition, your dedication to providing veterans with medical and dental care, legal assistance, employment, training, and transitional housing services has enabled countless homeless veterans to fulfill their promise and potential as upstanding contributors to the community. I am proud of our work together on veterans programs. It has been rewarding to see homeless veterans in our communities receive the support and respect they deserve. I join the South Bay, Harbor Cities, and greater Southern California communities in thanking and supporting your commitment to homeless veterans. You and Doris are special people, and we all appreciate the work that you do. You, Doris, Kenny, and your organization mean so much to me. We've got lots more to do together." "United Stated Office of Personnel Management pursues veterans through partnership with the Los Angeles, California, Kenny Nickelson Memorial Foundation for Homeless Veterans and Children. In this way, we are making a small payment on the debt of gratitude all Americans owe our Veterans for their courageous service." 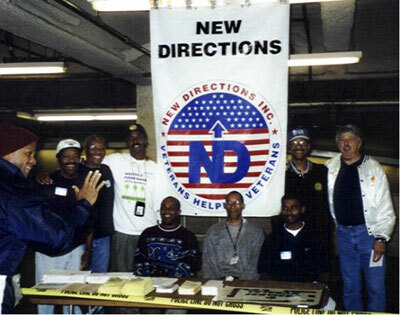 "Since Stand Down's founding, The Kenny Nickelson Memorial Foundation for Homeless Veterans has built a successful community-based intervention program to assist the nation's estimated 275,000 homeless veterans. I salute your enduring commitment to improve the health and well-being of these veterans by providing medical, legal, and employment programs as well as other assistance. Your efforts foster social interaction in an environment that promotes self-reliance, self-respect, and camaraderie. I salute you for your dedication to our veterans, whose noble service is an inspiration to all Americans." "I have been familiar with the operations of KNMF and have known the organization's principals, Nick and Doris Nickelson since 1993. This has included attendance at several KNMF Personal Care Days and frequent visits and communications with the Nickelsons regarding their charity. 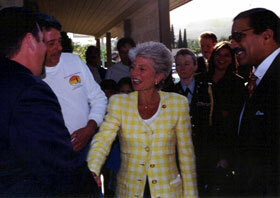 KNMF has had a long and very successful partnership with the Department of Veterans Affairs, which provides professional counselors and caregivers to their homeless veteran events, and wide range of other government and non-profit groups that provide services in support of or in coordination with KNMF programs. KNMF also secures the services of scores of volunteers for its events. 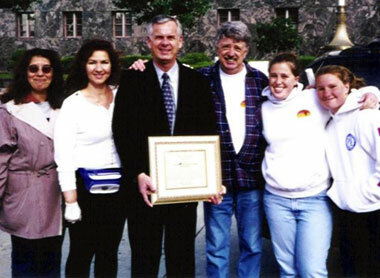 As a result of the tireless and creative efforts of the Nickelsons, KNMF has achieved remarkable successes over the years in fighting homelessness among veterans and children. I do not know of a harder working, more deserving organization in this area. I strongly urge that it be given the support it needs to continue its invaluable efforts"